The invention discloses a method for removing cyanuric acid in waste water of a swimming pool by adsorption of activated-carbon fibrofelt and for regenerating the activated-carbon fibrofelt by electric desorption to realize cyclic utilization of the activated-carbon fibrofelt. According to the technical scheme, the method comprises the following steps that: firstly, the activated-carbon fibrofelt is placed into cyanuric acid solution of a series of simulated swimming pool waste water with different salinity and different pH environment conditions, and adsorption equilibrium is realized under conditions of constant temperature and constant-speed stirring; and secondly, the activated-carbon fibrofelt used in adsorption wraps a pure titanium sheet to serve as a cathode, another pure titanium sheet with the same size serves as an anode, the cathode and the anode are put into clear water with electrolyte concentration simultaneously and then are electrified, and electric stripping equilibrium is achieved under a constant-temperature and constant-current condition, so that the activated-carbon fibrofelt is recycled, and the cyanuric acid in the swimming pool waste water is subjected to enrichment recovery and desorption to become fresh water to serve as replenishment of swimming pool water. According to the invention, the technological process is simple, incomes are high, energy is saved, and the efficiency is high, so that the method is applicable to industrialized production. 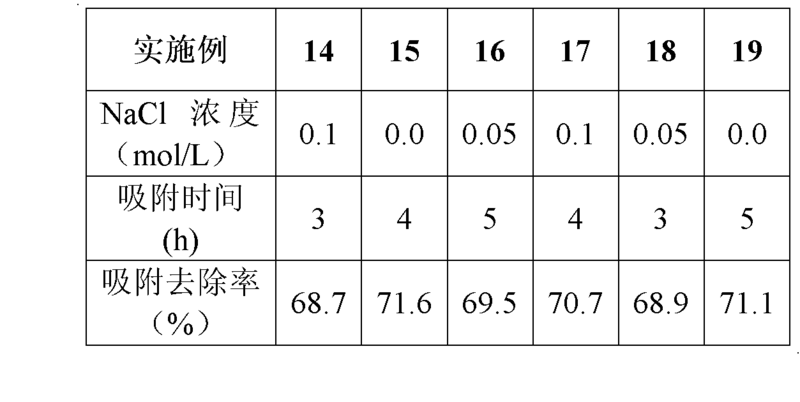 本发明方法涉及废水中三聚氰酸的去除以及活性炭纤维毡再生的技术领域，具体涉及一种利用活性炭纤维毡吸附去除泳池废水中的三聚氰酸并通过电脱附对活性炭纤维毡再生实现循环使用的方法。  The present invention relates to a method of wastewater BACKGROUND cyanuric removal and regeneration of activated carbon fiber felt, particularly to adsorb and remove active carbon fiber felt pool cyanuric acid wastewater and activated carbon fibers by utilizing electrical desorption felt implementation recycled regeneration. 三聚氰酸是一种三嗪类含氮杂环化合物，三聚氰酸和三氯异氰尿酸还是食品防腐剂、漂白剂、农药、除草剂、消毒剂以及氯稳定剂的原料。  Cyanuric acid is a nitrogen-containing heterocyclic triazine compounds, cyanuric acid starting material and TCCA or food preservatives, bleaching agents, pesticides, herbicides, disinfectants and chlorine stabilizer . 三聚氰酸常与氯类消毒剂共用于游泳池消毒，以减缓起消毒作用的氯气被阳光分解的速度。 Constant speed with cyanuric chloride disinfectant for swimming pool disinfection were to slow the disinfecting action of chlorine is decomposed sunlight. 而且三聚氰胺与三聚氰酸同时摄入体内，二者依靠分子结构上的氢氧基与氨基之间形成水合键而相互连接，这种连接可以反复进行，形成一个网格结构，最终形成不溶于水的大分子复合物，并沉积下来，形成结石。 And melamine and cyanuric acid ingested simultaneously, both between the hydroxyl group and an amino rely on molecular structure and bond to each other form a hydrated connection which can be repeated to form a grid structure, forming insoluble macromolecular complexes of water, and deposited, to form stones. 对人体健康和生物环境危害极大，属处理难度较大的化合物。 On human health and biological environment great harm, it is a compound of handling difficult. 目前主要用氧化法、电解法、 离子交换吸附等方法对三聚氰酸废水进行处理，这些方法存在着处理效率低，成本高、操作复杂、处理剂不能循环利用、造成二次污染等缺点，难以在实际废水处理中进行广泛应用。 Mainly of cyanuric acid wastewater treatment by oxidation, electrolysis, ion exchange adsorption methods that problems of low efficiency, high cost, complexity of operation, the processing agent can not be recycled, resulting in secondary pollution and other shortcomings, difficult in practice widely used in wastewater treatment. 活性炭纤维毡是继粉状和粒状活性炭之后在碳纤维和活性炭结合的基础上发展起来的第三代新型、高效、多功能的纤维状吸附材料，一般是用天然纤维或人造有机化学纤维经过碳化、活化处理而制成，其主要成分由碳原子以类似石墨微晶片、乳层堆叠的形式存在，由于表面分布大量狭窄而均匀的微孔且比表面积巨大，对有机物的吸附具有大的吸附容量和很高的吸附效率；另外其脱附速度快，再生比较容易；并有很好的耐热、耐酸碱、良好的导电性和化学稳定性等特点；目前已被广泛应用于国防、环境保护、化学工艺、医疗卫生、电化学等领域并已实现工业化生产。  Activated carbon fiber felt is the third generation of new, highly efficient, versatile fibrous adsorbent activated carbon powder and granular after development on the basis of carbon fibers and activated on binding, generally made of natural fibers or synthetic fibers of organic chemistry after carbonization, activation treatment is made, the main ingredient, the milk layer stack consists of carbon atoms present in the form of graphite similar to microchip, the surface distribution of a large number of narrow and uniform cells and a great specific surface area, a large adsorption organics high adsorption capacity and adsorption efficiency; Further desorption of its fast speed, easier regeneration; characteristic and good heat, acid, good electrical conductivity and chemical stability; has been widely used in national defense , environmental protection, chemical technology, health care, electrochemistry and other fields and has industrial production. 吸附指物质（主要是固体物质）表面吸住周围介质（液体或气体）中的分子或离子现象。  Adsorption refers to a substance (primarily solid matter) surface attracts the surrounding medium (liquid or gas) molecules or ions phenomena. 吸附属于一种传质过程，物质内部的分子和周围分子有互相吸引的引力，但物质表面的分子，其中相对物质外部的作用力没有充分发挥，所以液体或固体物质的表面可以吸附其他的液体或气体，尤其是表面面积很大的情况下，这种吸附力能产生很大的作用，所以工业上经常利用大表面积的物质进行吸附，利用吸附剂去除废水中的难处理的物质，是一种十分高效、环保、节能的方法，也是近年来的研究热点。 Adsorption mass transfer process belongs to, and the molecules inside the surrounding molecules attract each other substances gravity, but the surface of the molecular species, wherein the external force opposing material not fully, so that the surface of the liquid or solid material in another liquid may be adsorbed or a gas, in particular the case of large surface area, the suction force can produce a great effect, it is often used industrially for the large surface area of ​​the adsorbent material, using an adsorbent material in the wastewater to remove intractable, is a kind of highly efficient, environmentally friendly, energy-saving method is the hot topic in recent years. 电脱附主要是指在直流电场的作用下，吸附剂表面吸附的物质因电泳力的作用脱附下来，使吸附剂能活化再生，达到循环利用的目的，是目前正在研究的新型再生技术。  Electric desorption mainly refers to the action of a DC electric field, the adsorbent material adsorbed on the surface by the action of the electrophoretic force desorb, the adsorbent regeneration can be activated, to achieve the purpose of recycling, currently under study is a new regeneration technology. 该方法操作方便且效率高、能耗低，其处理对象所受局限性较小，处理工艺完善，可以避免二次污染。 This method easy operation and high efficiency, low energy consumption, which is due to little processed limitations, improvement treatment process, to avoid secondary pollution. 现有技术中从未有过利用活性炭纤维毡吸附去除水中三聚氰酸并通过电脱附对活性炭纤维毡进行再生循环利用的报道，目前利用活性炭纤维毡吸附去除法是对三聚氰酸处理最为环保，成本最低，去除率较高，最有利于工业化的方法。  The prior art has never been adsorbed and removed by using activated carbon fiber felt and cyanuric acid in water coverage of recycling of activated carbon fiber felt by electroporation desorption, the current use of activated carbon fiber felt is removed by adsorption method trimerization most environmentally friendly, low cost, high removal rate, the most industrially advantageous method cyanate process. 步骤二、将吸附使用后的活性炭纤维毡取出，包裹在纯钛片上作为阴极，选择相同尺寸的纯钛片作为阳极，然后将阴、阳极同时置入具有一定电解质浓度的清水中，通电，恒温25°C恒电流40mA条件下进行电脱附，即可实现活性炭纤维毡的再生；并且还可以实现对游泳池废水中三聚氰酸的富集回收，三聚氰酸脱附至清水中后可以作为泳池水的补给。  Step two, the adsorption of activated carbon fiber mat removed after use, wrapped in pure titanium plate as a cathode, a titanium sheet select the same size as the anode, and the cathode, while the anode into water having a certain concentration of the electrolyte, performed under power, temperature 25 ° C at a constant current 40mA electrical desorption conditions, to achieve regeneration of activated carbon fiber mat; and also allows the recovery of the enrichment pool wastewater cyanuric acid, cyanuric acid to water desorption after that could serve as the pool of water supplies. 所述游泳池废水的pH值为6. 0-8. O,最佳pH值为7. O。  The pH value of the waste water pool 6. 0-8. O, the optimum pH is 7. O. 所述的吸附时间为3_5h，最佳时间为4h。  The adsorption time is 3_5h, the best time is 4h. 所述的电脱附时间为5_30min,优选为5_20min,最佳为15min。 Electric desorption time  according to 5_30min, preferably 5_20min, most preferably 15min. 3、整个工艺操作过程简单易行，成本较低，效率高，时间短，能实现资源的回收利用，收益大。  3, the process operation process is simple, low cost, high efficiency, short time, can realize recycling of resources, large gains. 下面结合具体的实施例对本发明方法做进一步的详细说明，应理解，以下实施例不以任何方式对本发明的保护范围造成限制。  Examples of specific embodiments further below in conjunction with the detailed description of the method of the present invention, it should be understood that the following embodiments do not pose a limitation on the scope of the present invention in any way. 由于实际泳池废水中三聚氰酸浓度约为500±50mg/L，pH约为6. 0-8. O ;盐浓度约为O. 0-0. lmol/L,以下实施例1-19中所用的三聚氰酸泳池废水均为模拟废水，水溶液中的盐分及所述的电解质用NaCl代替，三聚氰酸由国药集团化学试剂有限公司生产。  As the actual wastewater cyanuric pool concentration of about 500 ± 50mg / L, pH about 6. 0-8 O;. Concentration of about O. 0-0 lmol / L, Example 1 below. cyanuric pool -19 wastewater are used in wastewater, salt and the aqueous solution was replaced with an electrolyte NaCl, cyanuric acid by the Sinopharm chemical reagent Co.
 配置浓度为500mg/L、NaCl浓度为O. Omol/L、pH = 7. O的三聚氰酸溶液200mL， 置入尺寸为3cmX6cm的活性炭纤维毡（购自山东雪圣科技股份有限公司，比表面积为2500cm2/g,以下实施例同），在恒温25°C，匀速搅拌条件下吸附4h后，将吸附使用后的活性炭纤维毡裹在尺寸为3cmX 3cm的纯钛片上作为阴极，尺寸为3cmX 3cm的纯钛片作为阳极， 将阴、阳极同时置入200mL含有0.05mol/L NaCl的清水（二次蒸馏水）中，通电，在恒温25 °C,恒电流40mA的条件下,脱附20min。  configured at a concentration of 500mg / L, NaCl at a concentration of O. Omol / L, pH = 7. O cyanuric solution 200mL, activated carbon fiber mats placed 3cmX6cm size (available from Shandong Xuesheng limited Technologies AG company, specific surface area 2500cm2 / g, Example with the following embodiment), at a constant temperature 25 ° C, with constant agitation conditions 4h after adsorption, the adsorption of activated carbon fiber felt after use wrapped on a titanium sheet size 3cmX 3cm as the cathode, 3cmX 3cm size of pure titanium plate as an anode, a cathode, while the anode into 200mL water containing 0.05mol / L NaCl (secondary distilled water), energized at a constant temperature 25 ° C, constant-current condition of 40mA, off attached 20min. 去除率及脱附率的测定：采用日立L-7000型高效液相色谱仪检测吸附和脱附体系中三聚氰酸的初始浓度、吸附后的浓度和脱附前的浓度、脱附后的浓度，以计算本发明方法的吸附去除率（活性炭纤维毡吸附去除的三聚氰酸的量占反应体系中三聚氰酸总量的百分比）和脱附率（电脱附脱去的三聚氰酸的量占脱附前活性碳纤维毡上所吸附的三聚氰酸总量的百分比）。 Determination of Rate of removal and desorption : The initial concentration of cyanuric Hitachi L-7000 high performance liquid chromatography detection system adsorption and desorption, concentration before and after adsorption desorption concentration, de concentration after attachment, the method of the present invention to calculate the adsorption removal rate (percentage of the total amount of cyanuric acid in the reaction system on adsorption of activated carbon fiber felt cyanuric acid) and the rate of desorption (desorption off electrically the cyanuric activated carbon desorption percentage of the total amount of cyanuric acid adsorbed on the fibrous mat before). 首先称取一定量三聚氰酸，以二次蒸馏水作为溶剂，分别配置一系列浓度的三聚氰酸标准溶液，用HPLC进行测定，以峰面积对浓度作标准曲线，根据标准曲线确定待测溶液的浓度，由浓度变化显示对三聚氰酸的吸附效果。 First weighed amount of cyanuric acid in double distilled water as a solvent, cyanuric are arranged a series of concentrations of the standard solution, was measured by HPLC, and the peak area of ​​concentration for the standard curve, measured according to the standard curve determined concentration of the solution, adsorption to display cyanuric acid by concentration changes. 最终测得活性炭纤维毡对三聚氰酸的吸附去除率为76. 2%，电脱附对活性炭纤维毡上的三聚氰酸的脱附率为92. 8%。  The activated carbon fiber felt measured final removal of cyanuric acid adsorption was 76.2%, the electrical desorption of cyanuric acid on activated carbon fiber felt desorption was 92.8%. 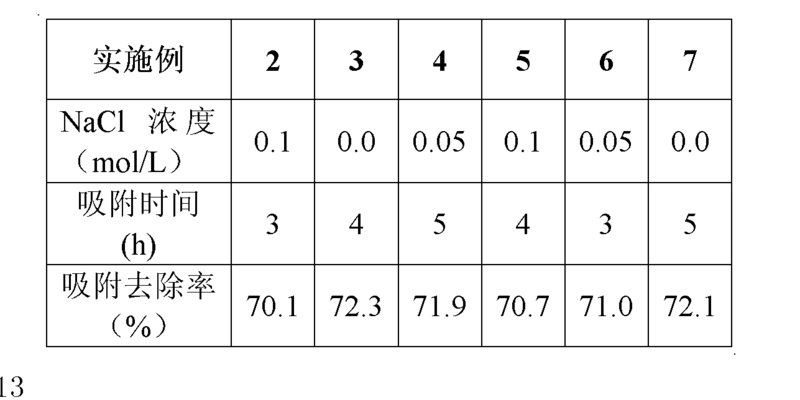 以下实施例中检测方法和计算方法与实施例I相同。  The following Examples detection method and calculation method of Example I with the same embodiment. 6. 0，吸附反应的部分其他条件和结果列于表1，脱附反应的条件和结果列于表4，其余未做说明的吸附和脱附操作条件均同实施例I。 6.0, the other part of the adsorption reaction conditions and results are shown in Table 1, the desorption reaction conditions and results are shown in Table 4, the remaining conditions of the adsorption and desorption operations are not done in the same manner as in Example I. 7. 0，吸附反应的部分其他条件和结果列于表2，脱附反应的条件和结果列于表4，其余未做说明的吸附和脱附操作条件均同实施例I。 7.0, the other part of the adsorption reaction conditions and results are shown in Table 2, the desorption reaction conditions and results are shown in Table 4, the remaining conditions of the adsorption and desorption operations are not done in the same manner as in Example I. 实施例14-19中的三聚氰酸水溶液体系的体积均为200mL，浓度均为500mg/L，pH = 8.0,吸附反应的部分其他条件和结果列于表3，脱附反应的条件和结果列于表4，其余未做说明的吸附和脱附操作条件均同实施例I。  The volume of cyanuric acid in an aqueous system are 14-19 Example 200 mL, concentrations were 500mg / L, pH = 8.0, some of the other adsorption reaction conditions and results are shown in Table 3, the desorption the conditions and results are shown in table 4, the remaining conditions of the adsorption and desorption operations are not done in the same manner as in Example I. 实施例20中的含三聚氰酸溶液的泳池废水取自中南民族大学游泳馆，经过滤澄清后，取200mL溶液，精密测得其三聚氰酸浓度为550mg/L，pH = 6. 8，盐（Cl-)浓度为O. 02mol/L，将尺寸为3cmX6cm的活性炭纤维毡置入所取的废水中，恒温25°C，吸附4h，测得其吸附去除率为76. 3% ;取出吸附后的活性炭纤维毡包裹在尺寸为3cmX3cm纯钛片上作为阴极，相同尺寸的纯钛片作为阳极，置入200mL含O. 05mol/LNaCl的清水中，通电，恒温25°C，恒电流40mA的条件下，电脱附15min，测得其脱附率为92. 5%。 Pool Wastewater  Embodiment 20 cases containing the cyanuric acid solution from National Central South University swimming pool, clarified by filtration, taken 200mL solution, the precise measured obtaining a concentration of cyanuric acid 550mg / L, pH = 6.8, salt (of Cl-) concentration of O. 02mol / L, a size of the activated carbon fiber felt into 3cmX6cm wastewater being taken, the thermostat 25 ° C, adsorption 4h, the adsorption removal rate was measured obtaining 76. 3%; mat wrapped activated carbon adsorption is taken as a size of a cathode, the same size as the pure titanium sheet titanium anode 3cmX3cm sheet into 200mL water containing O. 05mol / LNaCl, the power, temperature 25 ° C, under conditions of a constant current of 40mA, electrical desorption 15min, measured obtaining the desorption rate of 92.5%. 用第三次再生后的活性炭纤维毡做同上的吸附和电脱附实验，得第四次使用时的吸附去除率为53. 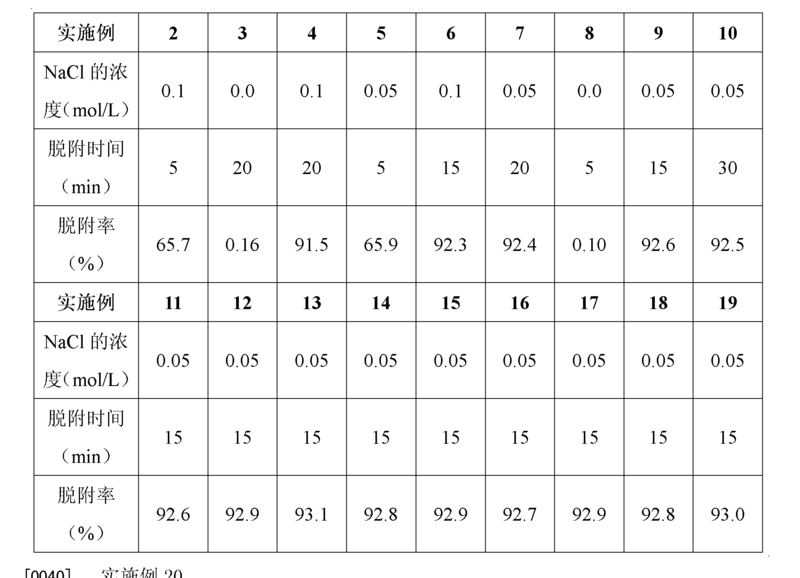 1%。  supra do adsorption and desorption experiments electrically activated carbon fiber felt after the third regeneration, the adsorption removal rate was obtained using the fourth time 53.1%. 以上实验结果说明活性炭纤维毡在处理实际含三聚氰酸的游泳池废水时显示出了良好的吸附和电脱附再生性能。  The results above indicate that the activated carbon fiber felt showed good adsorption and desorption properties of electrical regeneration when the actual wastewater treatment pool containing cyanuric. 1. 一种利用活性炭纤维毡吸附去除游泳池废水中的三聚氰酸并通过电脱附再生活性炭纤维毡实现循环利用的方法，其步骤如下：步骤一、将活性炭纤维毡置入游泳池废水中，在恒温25°c及匀速搅拌条件下进行吸附；步骤二、将吸附使用后的活性炭纤维毡取出，包裹在纯钛片上作为阴极，选择相同尺寸的纯钛片作为阳极，然后将阴、阳极同时置入具有一定电解质浓度的清水中，通电，恒温25°C恒电流40mA条件下进行电脱附，即可实现活性炭纤维毡的再生；所述游泳池废水的PH值为6. 0-8. O ；所述游泳池废水中的NaCl浓度为O. 0-0. lmol/L ；所述步骤二中的电解质为NaCl，其浓度为O. 05-0. lmol/L ；所述的吸附时间为3-5h，所述的电脱附时间为5-30min。 A use of activated carbon fiber felt pool Adsorption of cyanuric acid wastewater and regeneration of activated carbon fiber felt is achieved by a method of recycling of electrical desorption, the following steps: Step one, the activated carbon fiber felt wastewater into the pool, carried out at a constant temperature 25 ° c and the adsorption constant stirring conditions; step two, the adsorption of activated carbon fiber mat removed after use, wrapped in pure titanium plate as a cathode, a titanium sheet select the same size as the anode, and the cathode, while the anode into water having a certain concentration of the electrolyte in the energization, a constant temperature of 25 ° C for a constant current 40mA electrical desorption conditions, to achieve regeneration of activated carbon fiber felt; the PH value of the waste water pool 6. 0-8 O. ; NaCI concentration of the pool is wastewater O. 0-0 lmol / L;. step two of the electrolyte is NaCl, at a concentration of O. 05-0 lmol / L;. the adsorption time is 3 -5h, the electrical desorption time is 5-30min. 2.根据权利要求I所述的方法，其特征在于：所述游泳池废水的pH值为7. O。 2. The method as claimed in claim I, wherein: the pH value of the waste water pool 7. O. 3.根据权利要求I所述的方法，其特征在于：所述游泳池废水中的NaCl浓度为·O.0-0. 05mol/L。 3. The method as claimed in claim I, wherein: said pool of NaCl concentration wastewater · O.0-0 05mol / L..
5.根据权利要求I所述的方法，其特征在于：所述步骤二中的电解质NaCl的浓度为·0.05mol/L。 The method according to claim I, wherein: the NaCl concentration of the electrolyte in step two is · 0.05mol / L.
6.根据权利要求1 所述的方法，其特征在于:所述的吸附时间为4h。 6. The method according to claim 1, characterized in that: the adsorption time was 4h. 7.根据权利要求1 所述的方法，其特征在于:所述的电脱附时间为5-20min。 7. The method according to claim 1, wherein: said electrical desorption time is 5-20min. 8.根据权利要求7所述的方法，其特征在于:所述的电脱附时间为15min。 8. The method according to claim 7, wherein: said electrical desorption time was 15min.